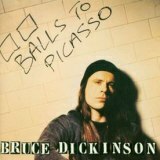 A far more straightforward album than the following Skunkworks, Balls To Picasso doesn’t have a great reputation amongst Bruce Dickinson fans. Which is a shame, because it’s a good album with some great songs, far better than Tattooed Millionaire. Bruce himself puts in an excellent, heartfelt performance that upgrades the songs with the quality that his voice always brings, and the various blues, Latin and reggae influences brought by Roy Z and the rest of the backing band are a welcome breath of fresh air. It’s all about the rock, however, and the collection of songs here is a solid one. The nearly-eight-minute Cyclops kicks the album off with tribal drum percussion and a sinister atmosphere combining with an almost too groovy guitar riff, Roy Z’s foot clearly heavy on the wah-pedal. It works, however, reminding me of very recent Maiden; lengthy, epic, and with enough of a progressive tint to make it interesting without losing that typical heavy metal crunch. As a formula, that pretty much defines the album, the moody likes of Hell No being elevated above the funky bass and percussion by the guitar and Bruce’s voice. Gods Of War’s semi-balladic nature mixes in some nicely heavy riffs, and stomping rocker 1000 Points Of Light is just stellar, mixing infectious riffing and a slightly nastier edge to Bruce’s voice with an excellent singalong chorus. The political topic is a bit heavy-handed, even without the sampled voiceovers, but it’s nowhere near enough to ruin your enjoyment of the song. Laughing In The Hiding Bush, Sacred Cowboys and Shoot All The Clowns are gleefully silly rockers, enjoyable and daft, even with rap sections in the latter two! Mid-paced groover Fire is probably the closest thing to filler on the album, although the only song that I’d actually call a miss here is ballad Change Of Heart. It’s not really a bad track but is rather uninteresting when compared to other songs on the album, not least the closing ballad Tears Of The Dragon which easily blows it, and most other Bruce Dickinson songs, out of the water. As hugely epic as the man himself, the song features an amazing performance from Bruce, not to mention a proggy instrumental white-reggae section and some amazing soloing! The music video is well worth watching, as usual with Bruce Dickinson. It’s hard to summarise Balls To Picasso up as a good but flawed album, as I had originally intended to before listening to it again for this review. Far, far better than I remembered, it’s the sort of album that might not blow your socks off but will certainly put a smile on your face, an example of what great results a fine singer can achieve with a less than perfect set of songs. Yes, Bruce would produce far better things as a solo artist, but Balls To Picasso is far from his worse, and is very worth re-exploring for those who had previously written it off.